Pinus bungeana, as described in 1847 by Joseph Gerhard Zuccarini (1790–1848) ex Stephan Friedrich Ladislaus Endlicher (1804–1849) is commonly known as lacebark pine as well as 白皮松 (bai pi song) in the Chinese language. The species name honors Alexander A. von Bunge (1803 - 1890), who collected the type specimen in 1831 while serving as Russian envoy to the imperial court of Beijing and who later wrote about the collections he makde in northern China and Mongolia. Ethnobotany. In Korea these conifers are used for lumber and their seeds and oil are eaten. 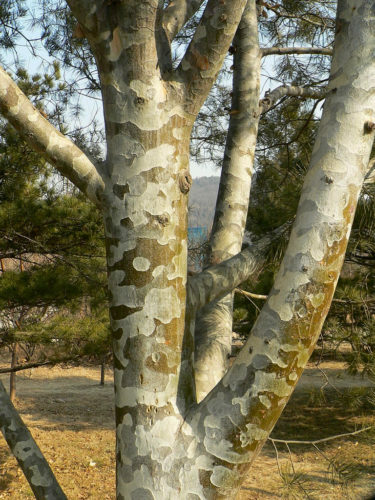 Naturalist, Tom Velardi reports, ""In Korea, a few trees grow in such areas as Seoul, Goyang and Icheon in Gyeonggi-do, Miryang in Gyeongsangnam-do, Boeun in Chungcheongbuk-do, and Yesan in Chungcheongnam-do. The largest of these trees are designated and protected as natural monuments"
Description. 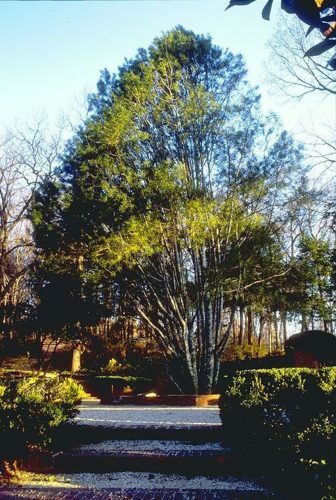 Lacebark pine is an evergreen coniferous species of tree that grows to mature heights of 75 to100 feet (24 - 30 m) with a trunk up to 46 inches (116 cm) in diameter, measured at breast height. 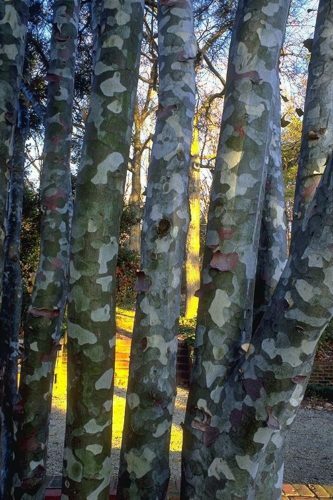 Bark on young trees is smooth, colored dull grey, scaling off in small patches like a Plane tree (Platanus spp. ), changing to chalky-white on old trunks, a characteristic which makes the species unmistakable from a long distance. Young shoots smooth, lacking pubescence, colored grayish green. Winter buds spindle-shaped, nearly 0.48 inch (12 mm) long, not resinous, composed of reddish brown scales. Leaves (needles) are produced in fascicles of 3 and grow rather sparsely arranged on the branchlets. They persist 3 to 4 years on the tree, giving off a turpentine-like odor when bruised. 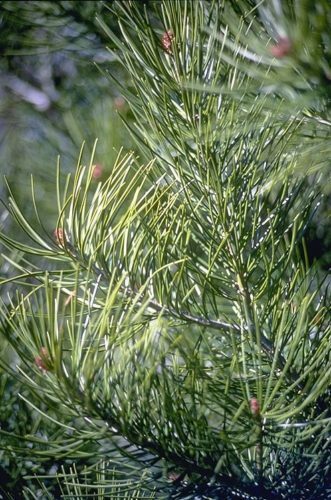 Needles are dark green color, rather rigid, flattened, 2 to 3 inches (5 - 7.5 cm) long with finely toothed margins, sharply pointed apices, and faint stomatal lines on each surface. Resin canals are marginal and prominent. Fascicle sheath soon falls away. Seed cones grow solitary or in pairs, sub-terminal but often appearing lateral by the growth of a summer shoot. They are globose or ovoid shaped, 2 to 2.5 inches (5 - 6.5 cm) long, on short. stout peduncles. Seed scales terminate with a reflexed, triangular spine. Seeds have a short, loosely attached wing. According to Dallimore, P. bungeana "closely resembles P. gerardiana, from which it is distinguished by its smaller cones and stiffer leaves. 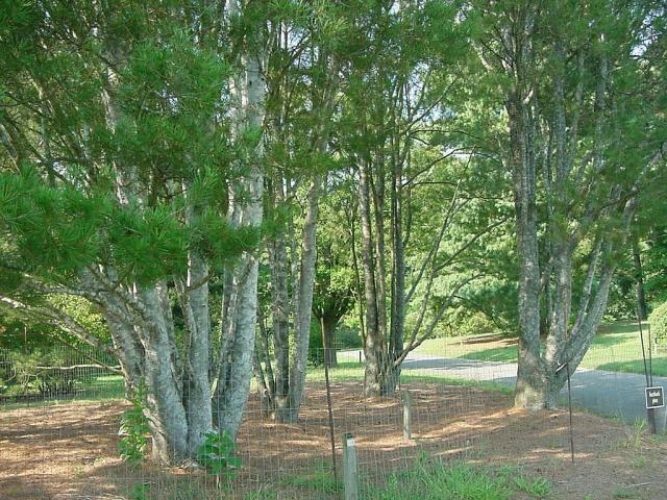 From other three-leaved pines it is separated by its smooth, scaling bark, sparsely arranged foliage, peculiar habit, and the strong odor of its bruised leaves. Distribution. This species is native to northwestern China. It is hardy to USDA Zone 5 — cold hardiness limit between -20° and -10°F (-28.8° and -23.3°C). Attribution from: William Dallimore, Albert Bruce Jackson, and S.G. Harrison; A handbook of Coniferae and Ginkgoaceae, 4th edition; ©1967, St. Martin's Press New York, NY. Pinus bungeana — a small grove of Lacebark pine. The specimens on the left are 'Silver Ghost'. 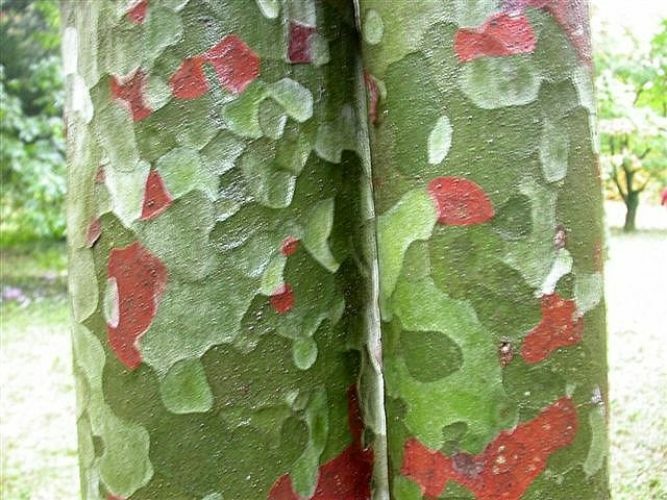 Notice the difference in the coloration of the bark. Pinus bungeana — photo courtesy of Sandra McLean Cutler, author of Dwarf & Unusual Conifers Coming of Age (bark detail). Pinus bungeana — photo courtesy of Sandra McLean Cutler, author of Dwarf & Unusual Conifers Coming of Age (foliage detail). Pinus bungeana — bark detail, photographed in its native China.